where so much can be done with so little. Of course, there are additional stitches you can learn, but I've seen, and stitched, entire patterns that used only a cross stitch and a backstitch. Eventually, though, a new design will catch your eye. A closer look reveals some stitches you've never done before. Don't be intimidated! From the basic cross stitch and backstitch, to French Knots and Daisy Stitches, I know you'll learn them all just as easily. So grab your fabric and floss, click on the stitches you'd like to learn. Our clear and detailed diagrams and carefully worded directions with have you stitching every pattern with confidence. 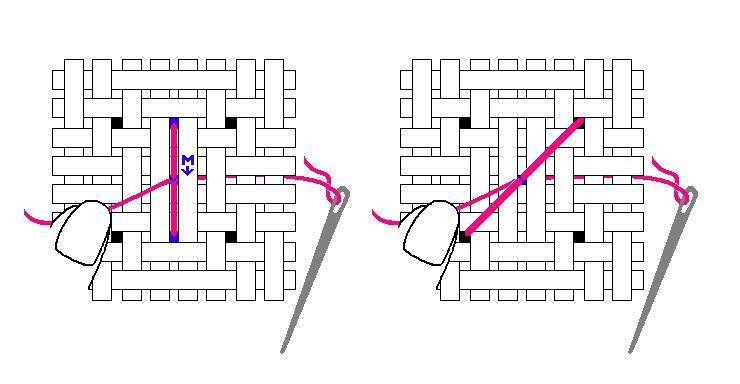 For step-by-step diagrams, click on the stitches below. Check out our newest tutorials! The Straight and Angled Pin Stitch is used in place of Burying the Thread. They take the frustration out of confetti stitches and frequent floss color changes. Over time, you will develop a "feel" for just how tightly to pull your floss to achieve the right tension in your stitches--too much and your fabric puckers, too loose and your stitches don't hold their shape. If you find yourself accidentally pulling the floss out of your needle, click on "Re-thread the Needle" above. Just like everything else, practice makes perfect. Click here to learn how to keep mistakes from turning into unfinished projects. How does cross stitch differ from needlepoint? 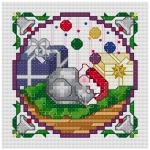 In cross stitch you add stitches to fabric. In needlepoint the stitches become the fabric. A comprehensive site for information and instruction in the modern look of this old craft can be found at All About Needlepoint.